Students from Wimbledon College of Arts in Merton and pupils from the south west London borough’s primary and secondary schools have been getting creative with junk as part of Merton Council’s recycling competition. The council set the challenge to create a beautiful costume out of materials that would otherwise have been thrown away. There have been over 60 entries and the shortlisted costumes will be judged on Friday 6 June at Wimbledon College of Arts. The judging panel includes Leader of the council Councillor Stephen Alambritis, Costume Design Pathway Leader Abigail Hammond from Wimbledon College of Arts and Sara Grundy, Costume Designer. Jude Ruth Furey from Ursuline High School’s costume celebrates the life of 12 year old Sadako Sasaki, a Japanese girl who suffered from leukaemia after the atomic bomb was dropped on Japan. She wanted to make 1000 origami cranes before she died as she wished for peace. She only folded 644. 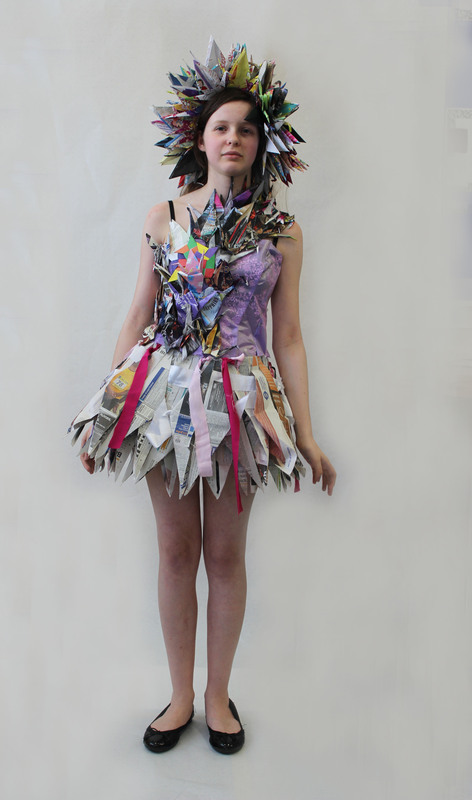 The costume is made from newspapers, magazines,wrapping paper, flower wrapping, and scrap fabric. Judges will look at the use of reworked and recycled materials and the students’ creativity, skill and innovation. Cash prizes will be awarded to three categories: primary school; secondary school and Wimbledon College of Arts. The shortlisted entries, which will be judged on 6 June, can be seen on the council’s Mega Recycle Facebook page. 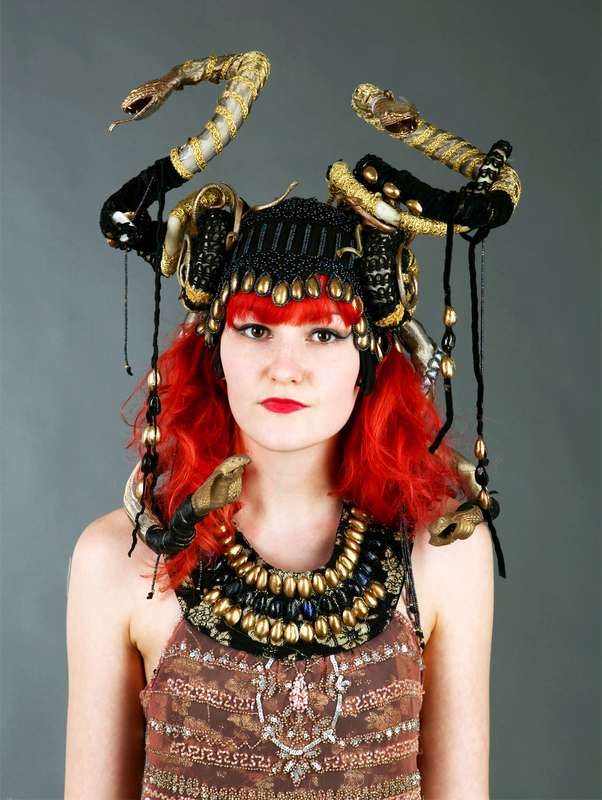 Becky Williams from Wimbledon College of Arts – her 1920 flapper girl combines Art Deco with Medusa/Egyptian influences. The headdress is decorated with spray-painted pistachios and the dress is recycled fabrics and pistachio decoration. Four secondary schools, 14 primary schools and 30 students from Wimbledon College of Art entered the Style Junkies competition. Every year the council spends £3.7m on landfill tax. For every tonne of waste that goes to landfill, the council has to pay out £82.50 in tax. 47,000 tonnes of rubbish from Merton goes into landfill every year.